This is the beginning of Trellis in Cotton Ease for a little boy who is due to arrive in mid-January (but, if he's anything like his two older sisters, is likely to arrive a month early). I think the knitty karma was working against me, though, because I had to rip and re-cast on three or four times before I was satisfied. The good news is that my sock mojo was not affected. Look, I finished my first Lenore! Did you know mostly black yarn is difficult to photograph accurately, especially when there's no natural light to be had? Tonight I'm going to be brave and tackle the seaming so that I can start the hood, and I'm going to block the sleeves as well. I am so close to finishing this sweater that I have no good excuse not to work on it. I could use it to keep me warm, too, since temps have gone down to freezing the past couple of nights. Sweater weather has arrived! How many of you, dear readers, are knitting sweaters right now? What sweaters are you knitting? We did make it to our dinner party Friday night and had a great time, but I think I overdid it a bit because I did not feel so well yesterday. So after venturing out to meet my parents for lunch and running a few errands, we came home and spent a quiet afternoon and evening that included plenty of knitting time. Although I was very tempted to work on my new STR socks (cast on Friday afternoon), I decided I would be good and work on finishing my Central Park Hoodie, which has been on the needles for nearly two months. These are very light, as they're made of thin coated wire. The hardest part about putting these together was trying to crimp the crimp beads; I think maybe my cheap miniature pliers are not the best for this task. I did eventually settle down with my CPH sleeves and got as far as completing the increases and getting ready to start the sleeve cap. I'm now just a handful of rows away from finishing, so this week the CPH will see some blocking and perhaps even some seaming, if I feel brave enough to try to conquer the set-in sleeve again. So that was my being good. As to my being bad? Let's just say I had a bit of a falling down at Michael's. For some reason, even though I was longing to get home and lie down, I felt compelled to go and buy some yarn (and, in all honesty, it did make me feel a little better!). I bought some non-yarn items as well, namely the beads and wire to make the stitch markers and some more tapestry needles (my spare package seems to have wandered off). But mostly there was yarn: three skeins of Cotton Ease to make this sweater for a new "cousin"-to-be, two skeins of Patons Classic Merino to make my father a scarf for Hannukah, and another three skeins to make this adorable little guy for ... me? a baby? We shall see. I guess the splurge wasn't that bad, considering the Patons was on sale for $4 a skein and more than half the yarn was specifically for gifts. I really really wanted to cast on for that bear right away, but as I said, I was good! I'm sure that when I have my CPH done to keep me warm (we have a frost advisory tonight! ), I'll be happy I was good and stuck to my plan. Tomorrow I go back to work, although I'll be leaving early to go to my follow-up appointment with my surgeon. I'm hoping that will be the end of the appendix story, as I'm tired of dealing with it and I'm sure you're all tired of hearing about it! This surgery thing has done wonders for my finishing of WIPs, let me tell you! 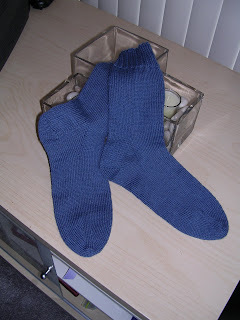 There's not much to say about these socks, as they are very plain and were a very straightforward (albeit somewhat boring) knit. They were cast on our first afternoon in Venice on our honeymoon and traveled with us to Greece, Turkey, and Croatia. The only thing really noteworthy about these socks is that the legs are an unusual length. Somehow I managed to pack stitch markers, thread scissors, and even tapestry needles with my yarn, but I completely forgot to throw in a tape measure. Without any way to accurately measure length, I relied on what I thought my row gauge was with this yarn (I figured roughly 11 rows/inch) and counted rows. So the cuff is 22 rows long and the rest of the leg is 55. I thought the 77 total rows would be about the 7 inches I normally use for my basic sock pattern; in reality, it's a little less. As I highly doubt my FIL will know this is the case, and I know he'll be thrilled with these socks anyway (he specifically requested "heathered blue" socks a while ago), I'm not sweating it. You can bet I always check to make sure I've got a tape measure now, though! 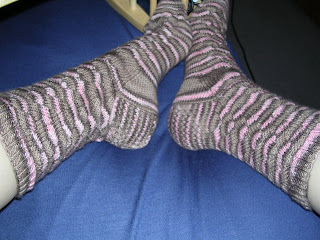 Now that these are done, I can finally cast on for my new Rockin' Sock Club shipment. I think this may be the first time I've actually started the shipment in the same month in which is was shipped. It appears I may have been a little clairvoyant this past weekend. Saturday afternoon, just hours before the appendicitis reared its ugly head, I made a stop at Knit One to finally use the gift card my bridesmaids gave me. It's almost as if I knew I'd be home for a week and would need some pretty wool to keep me company. 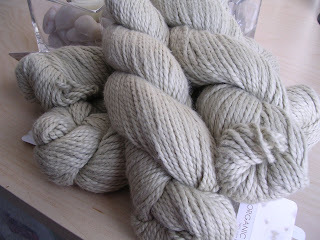 Blue Sky Alpacas Organic Cotton in natural green. Dreamy stuff. Someday I'd like a sweater for myself out of this stuff. I couldn't leave without some treats for myself, especially as it was all free to me. I picked up a couple skeins of Reynold's Soft Sea Wool, which I so enjoyed working with in Aidan's Red Sox sweater (which I certainly hope he's wearing for the World Series!) and the Canada socks. 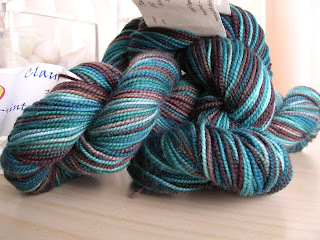 These particular skeins are intended for a pair of Denmark socks (inspired by Pat's). 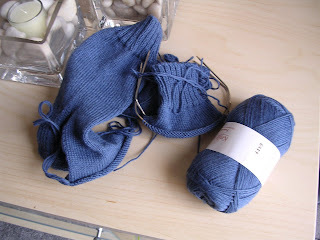 I think this will make a beautiful pair of simple stockinette socks. If I'm feeling up to it tomorrow, I will get out the swift and wind all of this as well as the new Socks That Rock (which you can see here; I think most people have received their kits by now, but I don't want to ruin the surprise for anyone who hasn't). Today was a better day. I was able to get out of bed (and actually stay out of bed), put on real clothes, and even make dinner. 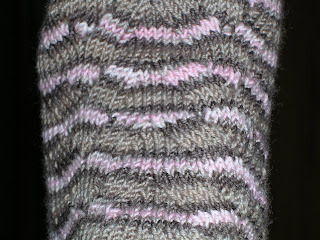 I spent the better part of the day test knitting a sock pattern. I can't show you pictures or give you any details until the pattern is done, but I can tell you it's knit with worsted weight yarn and thus goes very quickly. 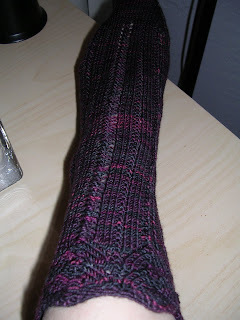 I'm also close to finishing the socks for my FIL, and then I will turn my attention back to the sweaters. Trust me when I say I'm making the most of my knitting time! Thank you for all of your good wishes for my speedy recovery! I think the positive thoughts of knitters are starting to pay off, because I'm feeling much better. I'm still nowhere near back to my old self (I'm still sore, tire easily, and have a bit of a buddha belly from the swelling), but tomorrow I should be able to spend the day out of bed and do things like get/cook food for myself. Today's big accomplishment was making it through the day without needing a nap. Granted, I did get 9 1/2 hours of sleep last night and spent pretty much the whole day in bed, but when you consider I needed a nap after a trip to the bathroom a couple of days ago, you can see what a big improvement that is. There's not much to say about this pattern that hasn't already been said. I'd been intending this colorway of STR specifically for this pattern; something about the name of the colorway asked to be knit into a pattern with an animal name, I guess. In any case, making these no purl was a great tactic for making this pattern an even faster knit. In truth, these did not take as long as it seems, because they were started just before we left for the trip and picked up again when we returned -- and I really wasn't able to knit until the end of my stay in the hospital. So these went quite quickly, and now that the weather has gotten a little cooler and more seasonal, I'm looking forward to wearing them. Tomorrow I hope to be out of bed, albeit still home-bound. We are supposed to be going to a dinner party Friday night, so I'm using that as my goal for the initial stage of recuperation. Keep those positive thoughts coming! P.S. Forgot to mention the surprise that made my day -- I made my first trip downstairs since getting home to pick up the package the mailman left in the door, which turned out to be my October Rockin' Sock Club shipment! I won't post any spoilers just yet; suffice it to say I hope I'm feeling well enough to get out my swift and ball winder tomorrow so I can get to knitting! Have you been wondering where the promised honeymoon post was the past few days? I know sometimes I can be a little lazy and let things like the blog fall by the wayside when things get crazy, but this time I have a good excuse. Ready for it? I was in the hospital recovering from surgery. I've just gotten home this afternoon and apparently the car ride and the walk up one flight of steps were so exhausting that I passed out for three hours this afternoon. So because my strength and stamina are clearly not where they should be, I'll give you the abbreviated version of the story. The Mister was out of town last week, so I spent Saturday getting all the errands and cleaning done around the house so that we could relax when he got home Saturday night. At around 5:30 Saturday evening, while I was watching TV and working on his Seamless Hybrid, I started getting a weird sensation in my lower abdomen and some cramping in my lower back. By the time he got home at 10:45, I was in horrible pain. We finally went to the emergency room about two hours later. They ran blood tests and did a CT scan, but all they could find was that my white blood cell count was up, indicating some sort of infection. They weren't sure what was wrong with me, so they sent me home at about 6 in the morning. Neither of us had really slept, so we both fell immediately into bed -- only to be woken about two hours later by the phone ringing. It was a doctor at the ER; apparently another radiologist had looked at the CT and determined that, although it was hard to see, there was an issue with my appendix and I needed to get back to the ER right away. We actually wound up going to a different hospital, as a good family friend of ours (a doctor) had called a surgeon he knew and arranged for him to meet us in the emergency room. Within an hour of arriving at the second ER, I was whisked off to surgery for an emergency appendectomy. I'll be doing my best to keep up with e-mail and blog reading in the next few days, but it all depends on how much strength I have and how long it lasts. I promise I will not forget about the promised honeymoon post; maybe now that I'm sitting in bed all day, I'll have the time to go through and label all the photos and upload them to Flickr. So that's where I've been, and I hope you'll bear with me while I get back to normal! Things are now relatively back to normal (that is, after leaving work midway through yesterday to spend the better part of the afternoon horizontal on the couch and then getting to bed at 9 p.m.). In an effort to get the blog up to date, I'm going to go with a list format for this entry. Knitting content will be at the end, for those of you who wish to skip over the other stuff. Thank you to all of you who left comments wishing us a good trip. We did have a fantastic time and saw some pretty amazing sights. I am planning a post or two on the trip soon in which I'll post some of my pictures; The Mister is leaving me again tomorrow for several days to attend a leadership conference in Virginia, so that might be a good opportunity for me to sit down and spend some quality time with my laptop. Stay tuned. I am finally caught up on my blog reading, which was quite a feat considering I had 120+ posts to get through. If I'm being completely honest, I will admit that I skimmed a lot of entries and made very few comments in the interest of getting up to date. Generally I make a concerted effort to comment on blogs I visit, because I do believe in the karma of blogging -- I enjoy getting comments, and I assume other bloggers do as well, so if I comment on other blogs I should get comments on my blog in return. Please know that if I visit your blog regularly, I've probably read what you wrote, but please don't take it personally if I didn't have any response to your post(s). Trust me, if you'd seen how what I was thinking was manifested in my typing yesterday, you probably would have thought it was spam because frankly it made no sense. Now that I'm all caught up, I will resume my regular commenting! 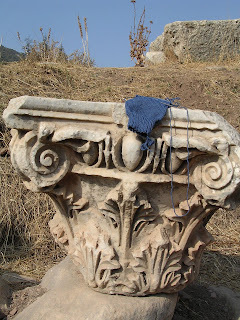 About a week before we left for the trip, I read a post on Octopus Knits about a new kind of exchange she was participating in and decided to sign up. It uses the concept of taking a random act of kindness and paying it forward. Here's how it works: The participant offers to send a handmade item to three people, and in return those three people make the same offer on their blogs. So I'm on board. I will make three handmade items (most likely knitting related) and send them to the first three people who e-mail me with their contact info. In return, all you have to do is post this same offer to your own blog and send out three handmade items of your own. Interested? Send me an e-mail at paknitwit AT gmail DOT com with your name, mailing address, and blog URL; I'll send the items to the first three people who respond. I won't be sending out the items immediately, but let's say within the next six months. So think of it as a surprise to look forward to when you least expect it. I also neglected to mention that about two days before we left, I received a Knit Picks order in the mail. Now before the alarm bells start ringing for breaking my yarn diet (really only self-imposed to save some money), I must note that the package contained primarily needles. 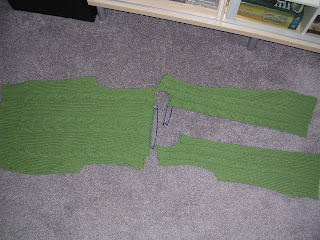 Most needed were some 16" circs that were desperately needed to knit the sleeves and collar of The Mister's Seamless Hybrid. I also found I needed some other circs for the Tangled Yoke Cardigan after swatching, and since everyone was raving about them, I picked up some of new Harmony wood dpns. All that was left in stock that I was interested in were the US 1 (2.25 mm), which are a little smaller than the US 1 1/2 (2.5 mm) needles I usually use, so I'll have to do a little swatching and see what they do to my gauge. I did order just a little bit of sock yarn, just to get to the free shipping threshold: two skeins of Essential in the colorway Carbon Twist (a black plied with a gray) for socks for The Mister and two skeins of Gloss in Woodland Sage for me. Let's do a number list for this one, shall we? Little Monkey Foo Foo: Did I ever mention these socks? 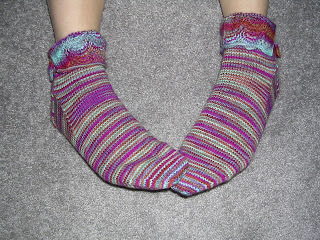 I cast them on right after finishing the Love Lace socks, as I was still feeling the need for some STR. 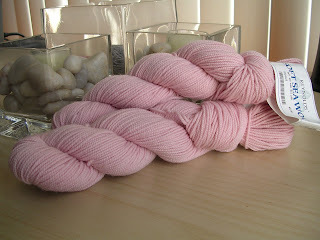 They're no-purl Monkeys, in the colorway Little Bunny Foo Foo -- hence my name for them. The first sock is almost done and I have no doubt the second soon will follow. The pattern is really fast to begin with, but taking out the purling? Superfast. Still with me? Well thanks for sticking around! I'll try to be less verbose now that I'm back to normal blogging. Now, time to wolf down some dinner and head out to meet up with the Hurricane Knitters! We're back! And we're quite a bit jetlagged. We got home at around 1 a.m. this morning, promptly rolled into bed, and passed out. We spent much of today running errands (grocery shopping, bank, etc.) and doing laundry (load three of four is in the dryer). I have a feeling we'll be getting to bed early again tonight. All in all, we had a fantastic time. We're in the process of going through all of our pictures (The Mister alone took more than 1,200! ); I'll post the best to my Flickr account later in the week, once I have time and energy to put in all the information so you'll know what you're looking at. 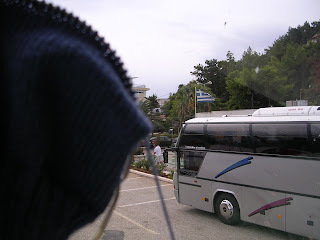 They also traveled to Dubrovnik, Croatia, where this knitter was so enthralled she forgot to take a picture. I am way behind in my blog reading and my e-mailing, so I hope you'll forgive me if I've been lax in responding to your e-mail or commenting. I hope I'll be caught up in a few days, but frankly right now sleep is more important than anything! Bear with me! Well, we are almost ready to leave. As it turns out, our flight schedule changed and we're now leaving a little earlier than originally planned. The good news is, we'll have a few hours in Boston between flights, so maybe I'll be able to get some chowdah! After many hours of consideration, I have decided not to try to take knitting on the plane with me. I don't think I'd have an issue on the domestic flight, but a number of threads on the Ravelry forums led me to believe I might have a problem with European security. I didn't think German security would buy the argument that my German-made Addis were perfectly safe, so rather than risk losing them, they'll be making the trip in my checked baggage. Instead, I'll have some podcasts to keep me company, as well as a teach-yourself Italian book to jog my memory (only a few years ago, I was "proficient"; I'm hoping it'll all come back to me). We'll be arriving in Venice midday Saturday and the cruise departs Sunday evening. If you're interested, you can follow our progress and see the ship's webcam here. These socks worked up incredibly quickly, which was a good thing, as I felt really bad for neglecting them for about a month. 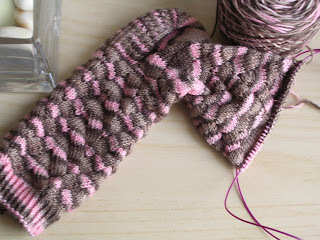 The only "complicated" part of the pattern was the cuff, which has a four-row repeat (two of which are purled across). What you can't see when the socks are worn is that there is an inch and a half of ribbing underneath the folded-down cuff. This was a design feature I was happy to discover. This is not a colorway I would have picked out on my own; it's probably a tad bit loud for my taste. 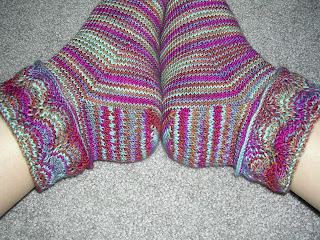 But it does work exceptionally well with this pattern and makes for some very happy socks. 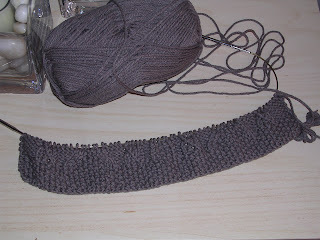 I am definitely going to knit this pattern again, although next time I will try it in a more subdued colorway. 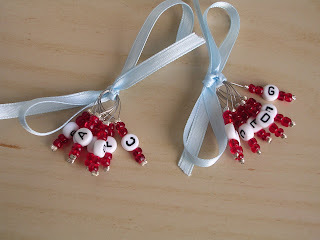 I'd like to see what happens to the lace cuff when it's paired with a semisolid. 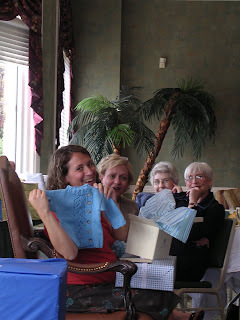 The mom-to-be received a lot of very nice gifts, including a great many very adorable baby outfits, but the women at the shower just could not get over the sweater. It was literally passed around the room so every attendee could examine it for herself. This is certainly validation of one's knitting, is it not? It's settled -- I'm knitting this sweater again! The Mister and I are getting ready for our honeymoon; we leave Friday. 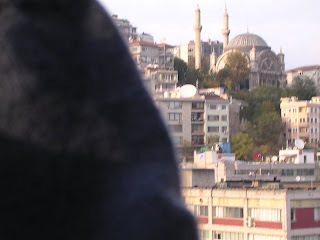 Blogging may be a bit spotty before we leave, and for that I hope you'll forgive me. I will be knitting with the Hurricane Knitters this Wednesday, so if you're in the area I hope to see you there!